Hang Tuah, Hang Li Poh, A Famosa, 'Chencalok', 'Asam Pedas'... all these always remind me of Melaka. But, when I first heard of 'Kg. Gadek'... I was totally lost! Didn't quite know what or how to relate this 'cute'-sounding name of a place with anything or everything to do with Melaka. Then, I was told that it is a very good place for enjoying a 'therapeutic' dip in a very, very hot natural spring pool. Wah! Another hot-spring spot with a 'cute' name like that? ... that I must go & check it out! 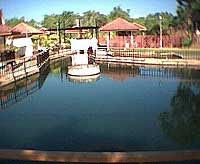 Gadek Hot Spring is 30km from Melaka city. 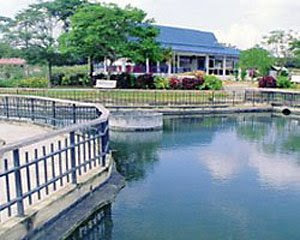 It is actually situated in the Alor Gajah district and indeed is only 5" away (driving) from Alor Gajah town. 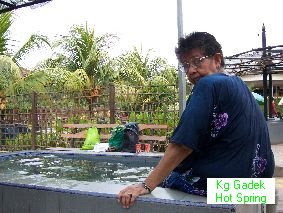 Its really quite easy to locate the Gadek Hot Spring complex. There are many signboards leading to the place along the way... just keep your eyes wide open:) And enjoy the scenery... typical Melaka villages, lush greenery, friendly people... and oops! Be careful with those chickens... goats... cows... and small children playing by the road side. I later found out that the hot spring complex was .... just the way i like it! No 'water-theme-park' ambiance, surrounded by greenery, clean toilets/shower rooms... and more importantly... it was only RM2 for an adult to enter the place! And only RM1 for children. I would say that the place was actually a 'semi' traditional hot spring complex. There were 2 main pools. One was 'just nice' hot and it was big and deep enough that you can actually swim in it. The other one was 'quite but bearable' hot. I preferred this one, of course. Fell In Love With The Twins...Thanks To Paris & Hollywood! NATUNA ISLANDS: ‘Eden’ of The Sunken Sundaland - The 272-islands of Natuna Archipelago is indeed a true and true 'eden' of the sunken Sunda Shelf of the Malay Archipelago!